Loughrigg Self-cateringThere are many walks from the door and Ambleside is well served with both local and specialist shops and a fine choice of restaurants. Tennis, bowls and mini-golf are two hundred yards away and lake cruises are easily to hand on Lake Windermere. Accommodation: Front door leads into the delightful sitting room (TV, DVD, video, cassette/radio/CD player, living flame gas fire). Striking dining/kitchen in light coloured beech, shaker style with soft steel fittings. Separate utility room with back door to the rear patio. Upstairs there are three bedrooms. The king-sized double to the front of the house is en-suite with shower, basin and wc. There is a twin room to the rear and a useful additional single room. Bathroom has bath with hand-held shower, basin and wc. Decor throughout is tasteful with pastel colours creating a light and airy feel and with pine in the bedrooms. Fitted carpets upstairs. Beechwood floors downstairs with rugs. The deep set windows with wide window sills are quite a feature, adding to the cottage feel. The cottage is fully insulated and very warm. Outside: Postage stamp garden to the front. Good rear patio garden has garden table and chairs and will be lovely for an evening barbecue or breakfast out of doors on warmer days. Separate store where bikes can be kept in safety. Private parking for one car. one small dog accepted * non-smoking * duvets/beds made up for arrival * towels provided * gas cooking * fridge * freezer * microwave * dishwasher * auto washer * tumble dryer * gas central heating and constant hot water * all fuel included * travel cot and high chair available - please order * village centre amenities all to hand * private parking for one car. 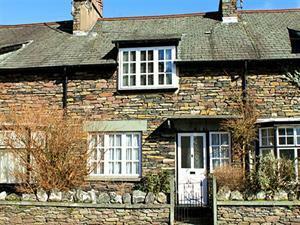 This is a most charming cottage right in the heart of Ambleside with all the village amenities on your doorstep. Loughrigg is in the middle of a short terrace of three, built at the turn of the century and will make an excellent base. Loughrigg offers weekly bookings starting on Saturday. All bed linen, towels and fuel included.